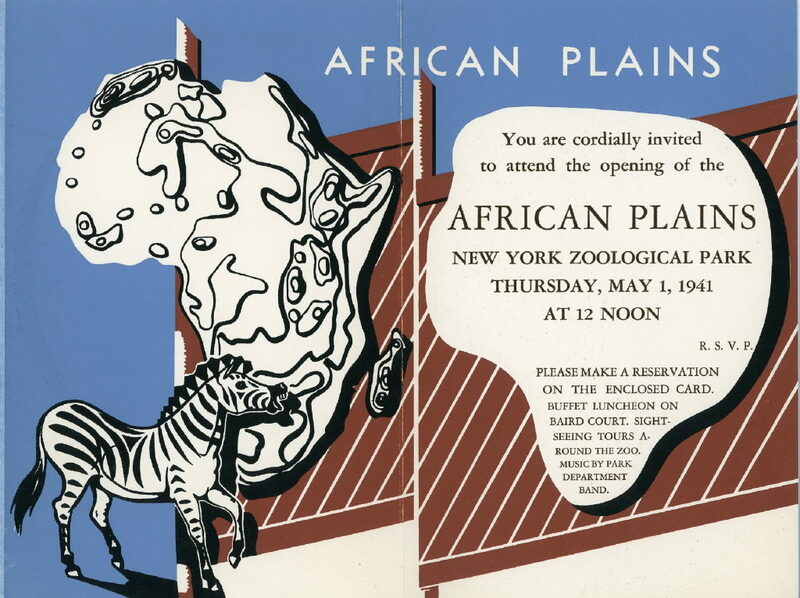 “A new vista to the wonders of Nature.” This is how New York Zoological Society President Fairfield Osborn described the brand new African Plains exhibit when it opened at the Bronx Zoo 75 years ago next week, on May 1, 1941. 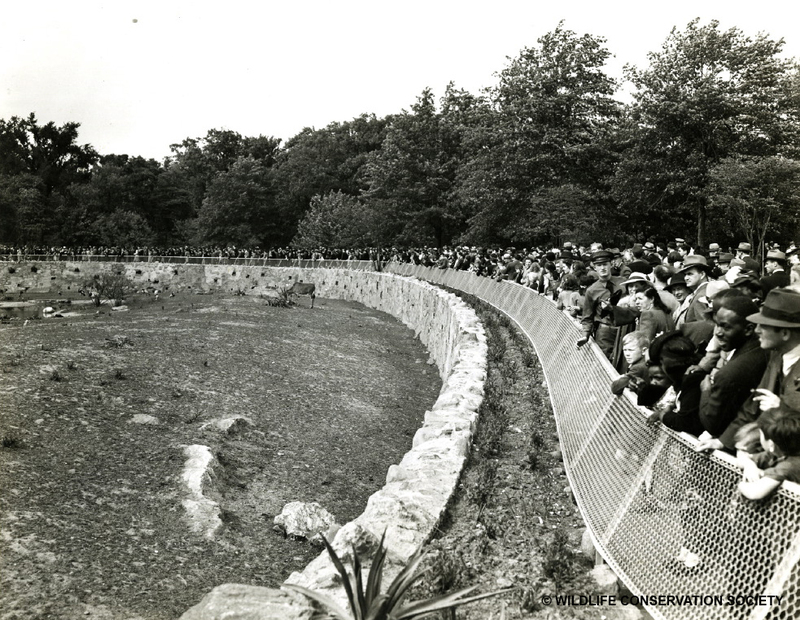 The exhibit—with its bringing together of several African species, including lions, zebras, nyalas, and many birds, into an expansive savannah landscape—was indeed a new vista for the Zoo. Whereas previous Bronx Zoo exhibits were conceived around animal orders or families—what Osborn referred to as “man-made classification”—and often indoors—think of the old Lion House, the Monkey House—the African Plains brought together animals based on geography, and it placed them in a naturalistic setting. 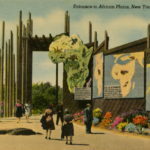 For Osborn, in the context of the Society’s history, the opening of the African Plains was “not only notable in itself… but in what it means for the future.” As he continued in the May/June 1941 issue of the Zoological Society Bulletin, “We have crossed a bridge and burned it behind us. A turning point in the development of the Zoo has not only been reached but passed. It is the beginning of the end of exhibiting our animal collections behind bars.” Osborn went on to intuit that it would be several years before this major transition in zoo design would take place. In fact, plans for a second phase of the African Plains, which was to include elephants, giraffes, and primates, were only partially realized with the development of the giraffe range several years later. And while the Society had the architects of the African Plains, W. K. Harrison & J. A. Foulihoux, draw up a new Bronx Zoo master plan in 1941 to incorporate other continent-based exhibits, these continental areas were not developed until decades later and in different areas of the Zoo. Still, the African Plains set the stage for other acclaimed exhibits like Wild Asia (opened in 1977), JungleWorld (opened in 1985), and Congo (opened in 1999). Actually, other zoos had experimented much earlier with the African Plains’ style of naturalistic, bar-less enclosures, but what was pioneering about the African Plains was its intention to display the ecological relationships among animals and their natural environments. 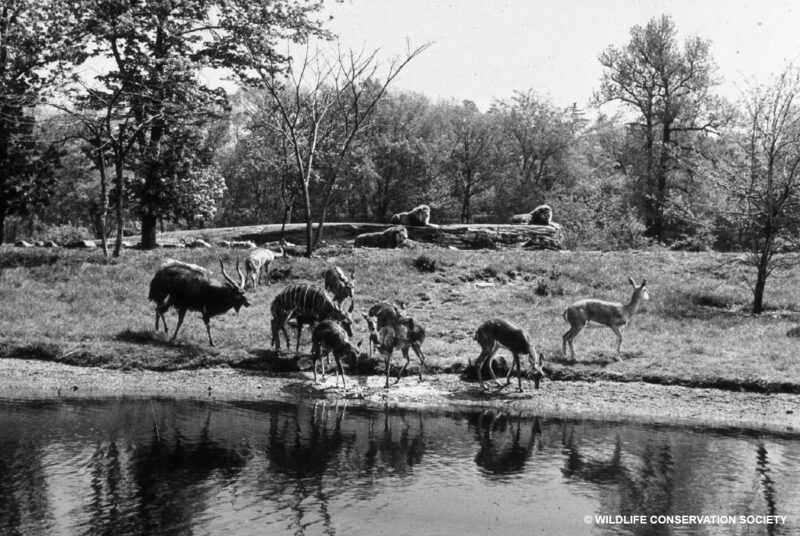 Showing this ecological interdependence was central to Osborn’s vision for the Bronx Zoo. 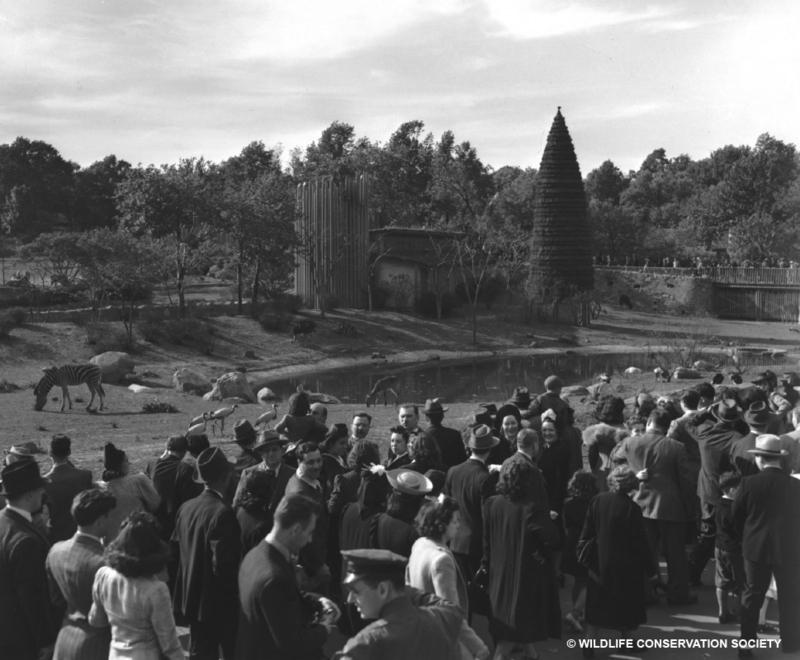 A leading conservationist of the period, Osborn saw the African Plains exhibit as an educational tool for making the public aware of the need to protect not only wildlife but also the places in which they lived—a vision that continues to guide zoo design today. The crowds gathered on that opening day heard from Osborn and Parks Commissioner Robert Moses, and Mayor LaGuardia performed the official opening. Others at the event included the German opera star Frieda Hempel, who sang the National Anthem. (There’s been no evidence of whether the exhibit’s anonymous benefactor–later revealed to be department store owner Marshall Field–was in attendance, but one suspects he was.) Among those covering the event were CBS journalists, who reported on the event from a wooden crate placed inside the lion exhibit. 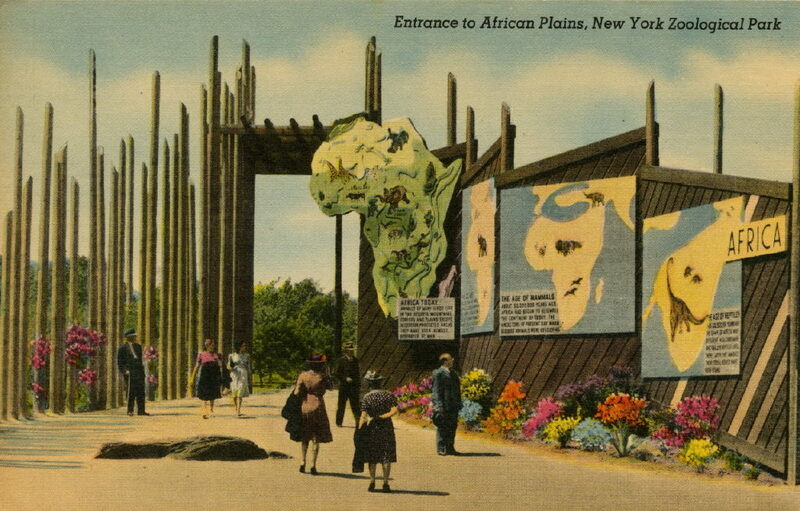 And all those seeking Osborn’s “hour of recreation,” and, he would hope, developing a new appreciation for the interconnectedness of the natural world, would indeed visit the African Plains: on the Sunday after the exhibit’s opening, nearly 85,000 visitors attended the Bronx Zoo—the largest single day’s attendance since the Zoo’s opening in 1899. Have you been to the African Plains? Do you think that Osborn’s vision is realized in it? Are you surprised to know that it is 75 years old? They knew how to treat reporters in the good old days!! !